Christmas decorations remain incomplete without centerpieces that, as the name suggests, are the center of attractions. It need not necessarily be a very elegant stuff to add beauty to your Christmas table. Anything can do the job, provided you use your creative side to put them together. 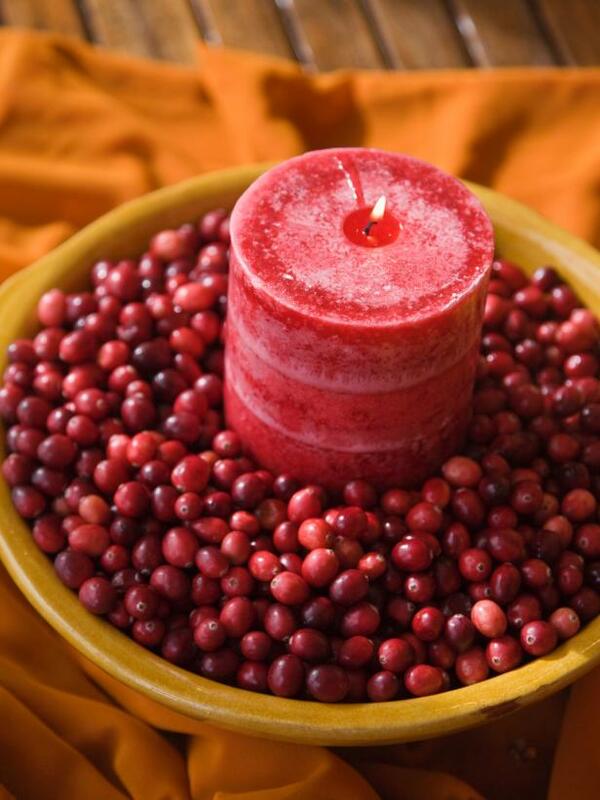 A simple, multiple armed candle stand, a bowl filled with red fruits, a goblet full of Christmas hued balls, a vase full of red flowers – the options are countless. And, of course, slightly tough too. 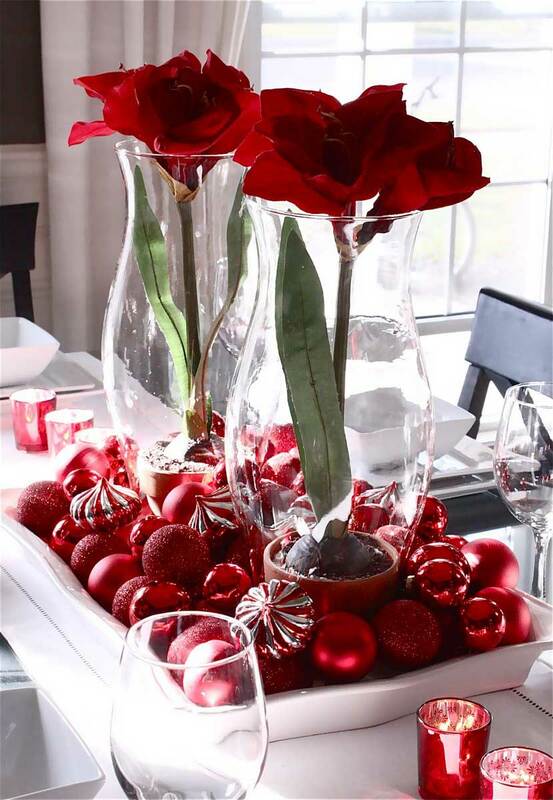 We have now made your task simple by putting together some of the easy, yet elegant Christmas centerpiece ideas here. Check out the ones below and decide how to go about it. Just look at this wonderful candle holder in the picture below. 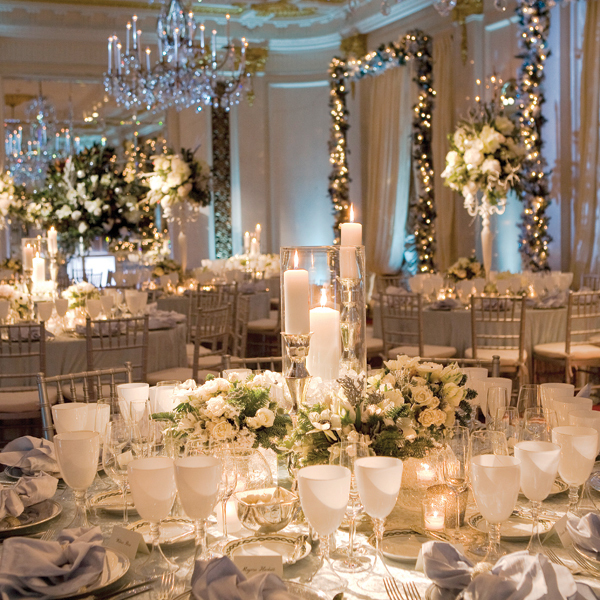 The golden glow it renders to your table transforms the whole room into a royal one. The perfect décor to celebrate the birth of the Lord! Isn’t it? 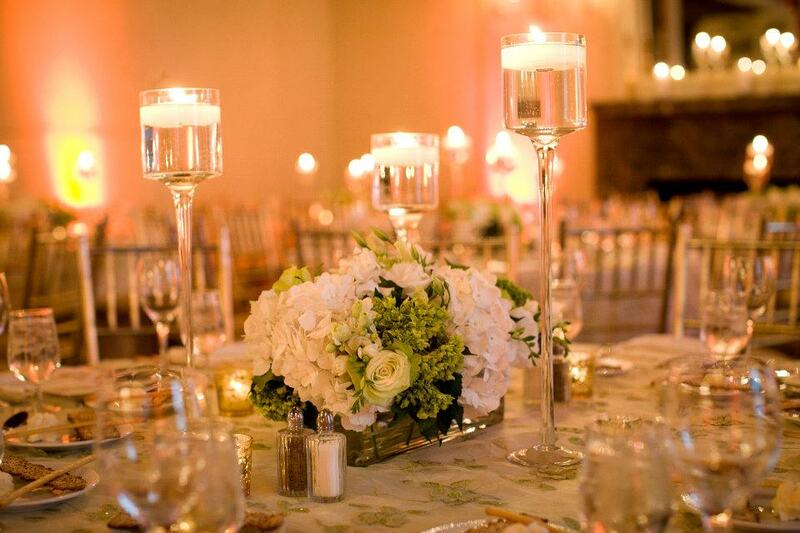 These subtle, yet marvelous floating candles do look ravishing. 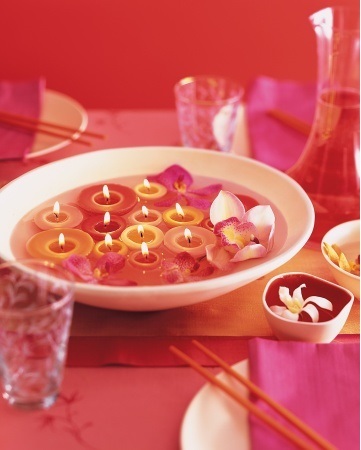 You can use these floating candles to adorn your Christmas dinner table. These are sure to fetch your compliments from your near and dear ones. 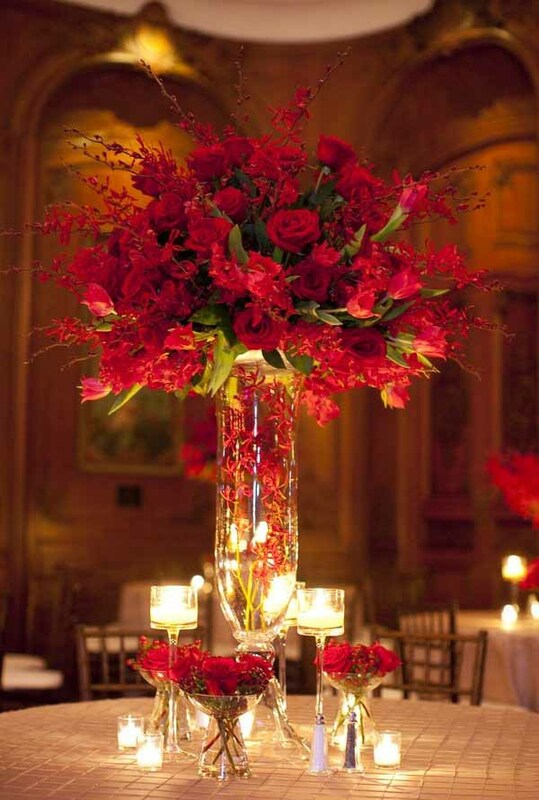 Just look at these red roses that have been placed in the golden vase… Wow! That was the very first word that I uttered while I looked at these. Brilliantly splendid! Didn’t you get enough time to put up your favorite grand Christmas tree? 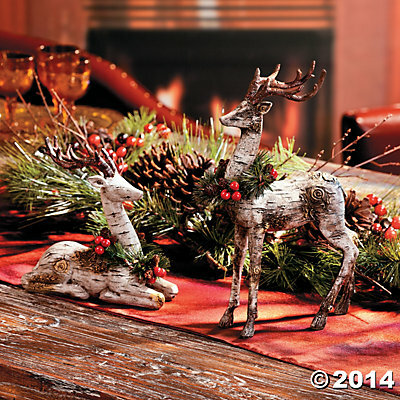 Do not get upset as this Chocolate Christmas Centerpiece is the answer to your worries. The below included picture is just a sample version taken from Asyouwish.co.nz. A great attraction, that is packed with edible goodness! Lovely! 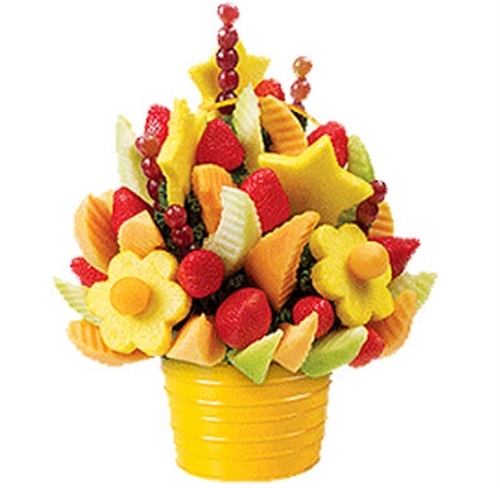 Fruits can be much more than healthy Christmas desserts. You have the option of ordering it from a nearby vendor or if you are good at food crafts, then you can definitely make this at home. These just look fabulous! You can create miniature versions of these bouquet and place them on the Christmas dinner table to add more hue and spice to the festivities. Your kids will also love these! Make an extra batch of these chocolate cupcakes loaded with an awesomely tasting peppermint buttercream. 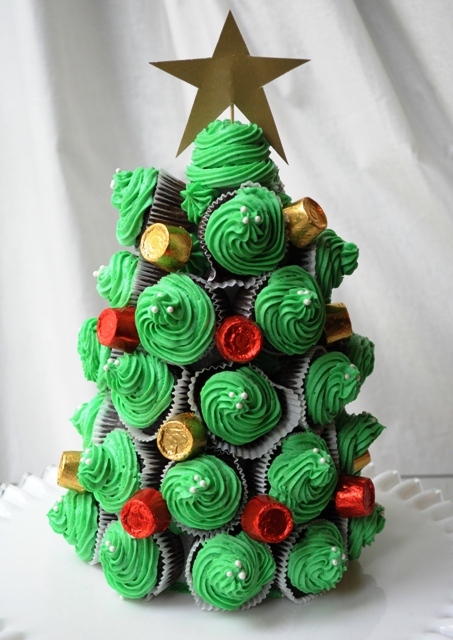 You can now use these to create an edible Christmas tree that will double up as the center of attraction of your Christmas table. Glance through the image that I have gathered from shelterness.com for an idea. 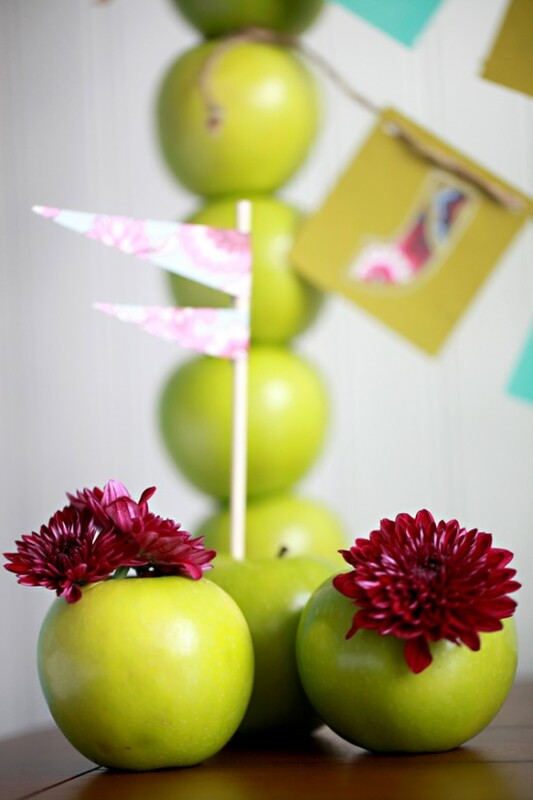 Green apples are not just good for your health; they make wonderful elements to create a DIY Christmas centerpiece too. This one is from onecharmingparty. It is quite simple to make. If you want a simpler idea, just take a tall glass and stack the apples in it. Pretty simple to make, but marvelous looking! How will feel when exposed to a delightful scent that comes from the blend of citrus and pine? Delighted? Amazing? Cool? Marvelous? For me, it is just fantabulous. And, why not. Both the aromas are rich and exotic. Both the scents are intoxicatingly regal and ideal for any celebration. Check out this one… It is simple, but has that regal appeal in it. Christmas is the time for gifting. You can now use the gifts you have to give away to your near and dear ones to put together a unique centerpiece. 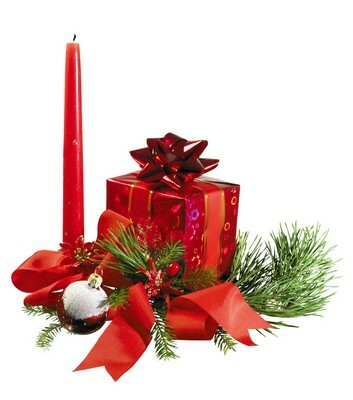 Choose red, green, and golden wrappers to envelop the presents so that the colors reflect the moment. You can create your own carnation with candles. Choose pure white candles and red flowers. This is the best color combo you can replicate. The carnation idea shown in the image below looks bright and brings with it all the colors associated with this holiday season. 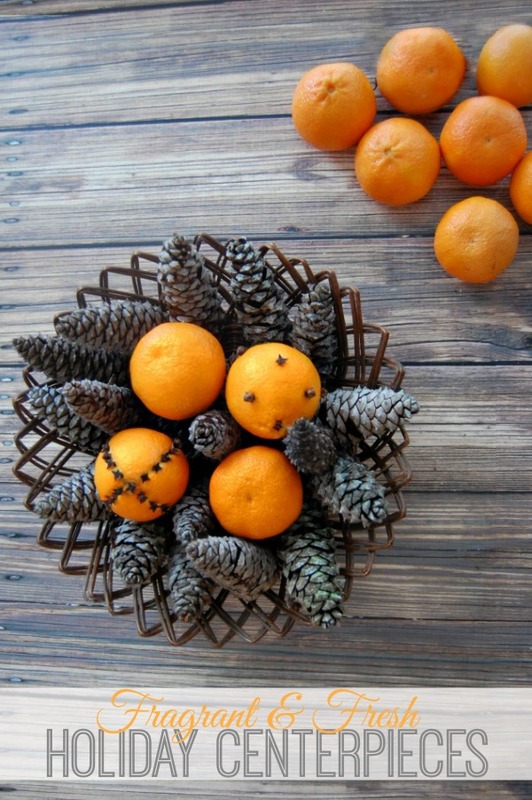 A classic and timeless Christmas centerpiece idea, you can even do it on your own. 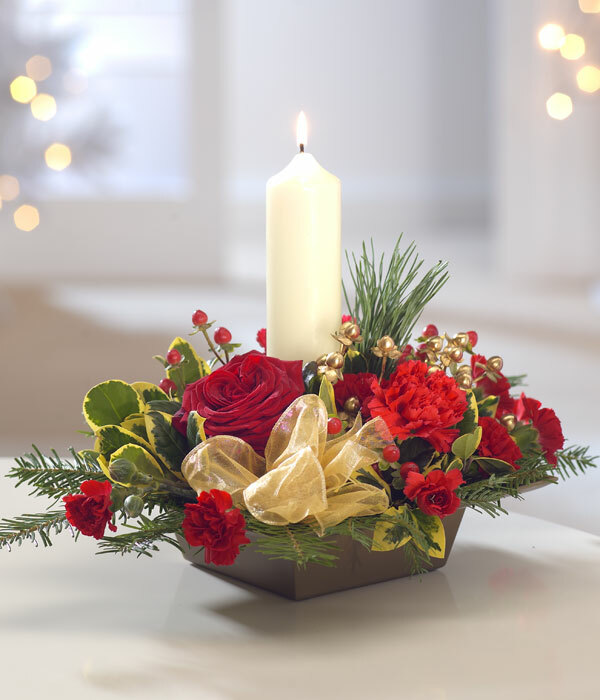 You will need a shallow tray, a bunch of red flowers, a golden piece of cloth, and a pure white candle. 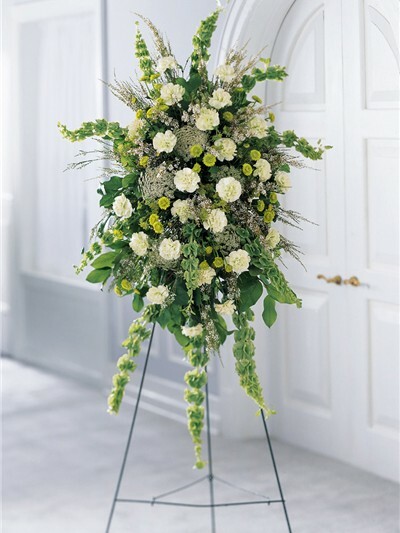 Do not forget those golden mock flowers and green leaves to add to the luxuriousness of the design. 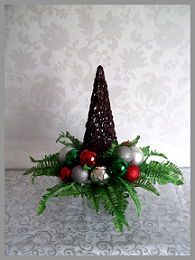 Running short of time and still want to put together some stunning centerpiece this Christmas? Here is a simple idea. Get some shiny red balls and a candle. 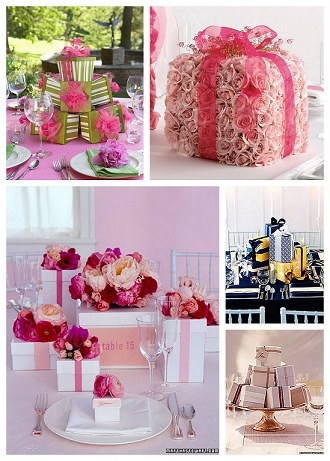 Choose the colors that will be in sync with the occasion. White or golden, red or green – the choice is yours. This one from hgtv.com is a simple one that is red, in and out. 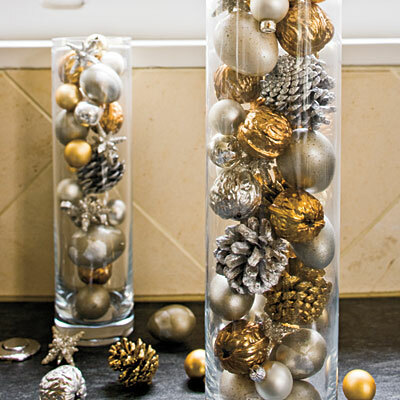 Fill your favorite tall juice jar will loads of golden and silver Christmas ornaments. You can choose stars, balls, pine cones, and even Santa sticks and hats to fill this cylinder of yours. Alternatively, any transparent dish will do the job of holding these fabulous masterpieces. 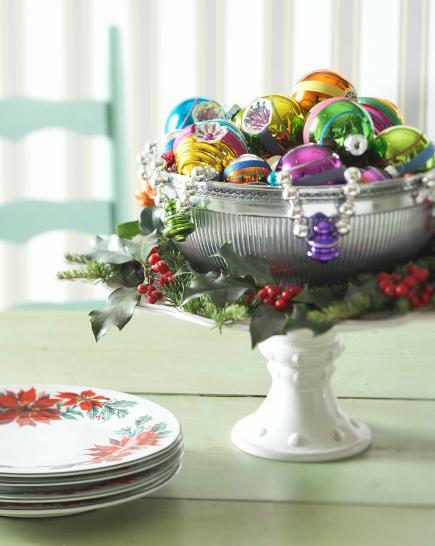 The one I have picked comes from Southernliving and adds a glamorous shimmer to your festivities. 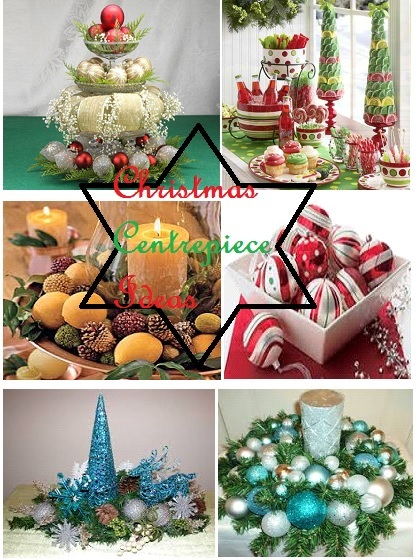 These were just brief suggestions about how can you put together some stunning Christmas centerpiece ideas in a very easy and simple way. What do you think about this collection? 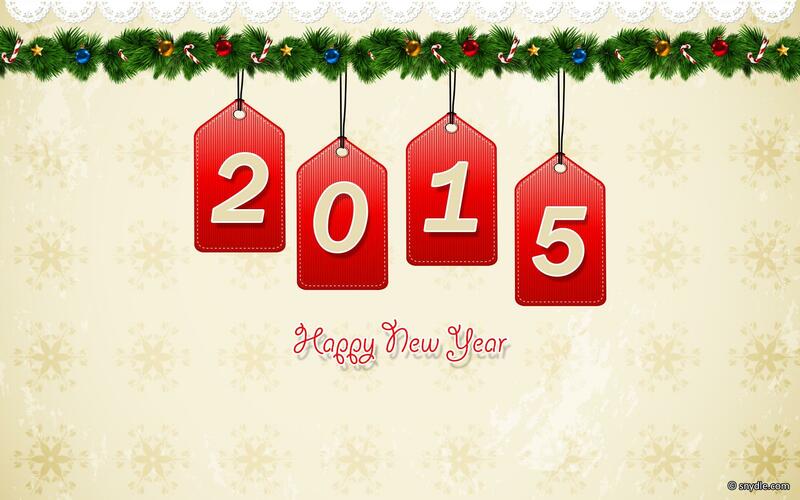 Wishing everyone a Merry Xmas and a Happy and Prosperous New Year! Have a fun filled Xmas party! Eat healthy! Enjoy your vacation with a great Christmas workout and have a great celebration!